The archipelago of the islands of Cres and Losinj is certainly a great destination for your vacation. A varied and jagged coastline bathed in sunshine, gently swaying pine tress and the sound of the sea is a great formula for relaxation. In camping Bijar and the surrounding area you will find a selection of different types of entertainment to keep you occupied on your holiday. Within the camp guests will find a courts for volleyball, basketball, table tennis and a special playground for children. If you're in the mood for soccer, good facilities can be found in Nerezine, a town 3 km from camp Bijar. Or why not take advantage of the many paths and roads leading to the coast for a walk or bike ride. Take a one hour walk to the highest peak on the island of Losinj, Osorscica, and enjoy the view of the entire archipelago. In amongst these options the campsite offesr a complete entertainment programme for guests. Gastronomic delights can be found at the buffet in the camp or in the many restaurants and coffee bars in Osor and Nerezine. Don’t miss the Apoxyomenos statue! While camping at Camp Bijar, we recommend you to visit the Apoxyomenos Museum in Mali Losinj city centre, opened in April 2016. 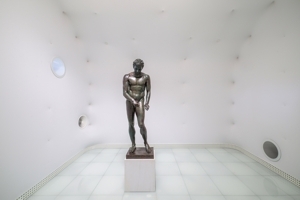 Museum is dedicated to the 2000 year old statue of this ancient Greek athlete.